This is a search term we've found to be quite common. so I thought I'd give you some insight into who they are what they do and where they've come from. Google is an American multinational corporation originally founded in 1996 by co-founders Larry Page and Sergey Brin. Their initial aim was to organize the world's information in such a way as to make it both accessible and useful to everyone trying to use it. there is also the sub-aim of not being evil this is reflected by the fact they had the words "Do not be evil" printed on their office wall. it's also shown in the fairness and the way they lay out their search results with organic listings occupying the bulk of the page and colored backgrounds differentiating paid adverts from the organic listings. Google originally was a search engine only they based everything else they've done all these other offerings of the success of their search algorithm which was so prevalent and successful it actually created a paradigm shift in the way that all other search engines measure the relevant authority of sites. one promoting another and so forth and this gave birth to the concepts of page rank which is a trademarked term by Google, but similar concepts existing in all other search algorithms nowadays and a very good measure of a website's authority. they have an estimated 1 million servers internationally in different data centers to process and store and manage this information. they're the massive company so going from you know two people creating an algorithm in 1996 to in 2010 having revenues of the sort of 30 billion US dollars and total company assets of around 60 billion dollars. but with fame and infamy come criticism and over the recent years, they have come under fire for a number of different areas of complaint such as a censorship copyrights and privacy being the most important to many of their users. this is largely because of the lack of privacy provided by Gmail because of the behavior advertising there's integrated into their AdWords system and the way in which they advertise to people. I think the best measure of their success in terms of their sort of permeation of modern culture is really in the fact they've changed the meaning of the word Google. they've changed it from its original mathematical definition of 100 over 1 or 1 with 100 zeros after it to in many cases of the verb as I'm sure what many people have heard the phrase "google it" as a way of referring to searching for something on the internet or finding something out. Weblog Tricks - Blogging Tricks for Beginners: What is Google? 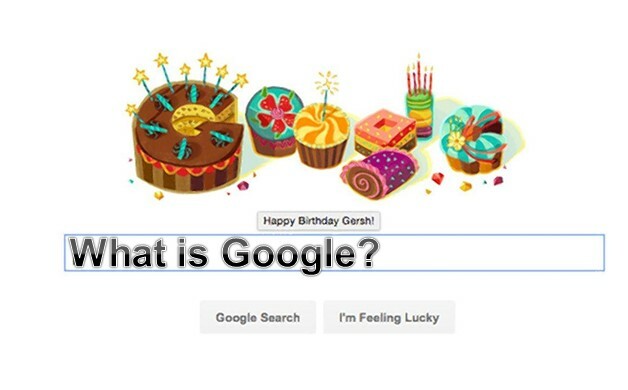 What is Google? Company Google is an American multinational corporation originally founded in 1996 by co-founders Larry Page and Sergey Brin.